Duck is a highly underestimated meat; in many countries, this U.S. delicacy is as affordable as pizza and just as popular. In this article, Maggie Zhu brings us the “best” slow-roasted duck, Beijing style. Start by using a pair of poultry shears to remove the duck neck and trim the neck skin. 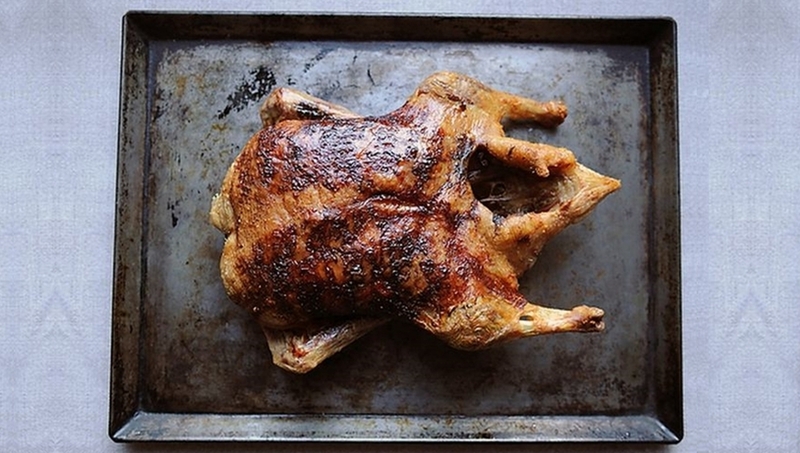 Care not to trim any skin from the bottom of the duck - this keeps the meat moist during roasting. Stuff the bird with oranges, but don’t be afraid to add other citrus (we tried lemons, limes, and blood orange). Use a sharp paring knife to then score the duck breast, about 1 cm (⅓ inch) apart. This will help the duck render fat faster and create a crispy, succulent skin. Finally, rub the bird with any type of salt. Pop in the oven for about five Black Mirror episodes (Zhu says forget about it until you have to smell it) at 200/250 F. Now watch another two episodes and your place should smell like a steakhouse – it’s time for dinner. Take the pan out carefully, transferring the bird to a platter for cutting. Let it sit for fifteen minutes (good, because you’ve run out of Black Mirror episodes to watch). Remove citrus before you start hacking, and be sure to use Zhu’s carving video for reference. Alternatively, you can use your inner barbarian and tear apart by hand. All the juices (fat) that gets disregarded in this process should be gathered as the base for our sauce. Dissolve 2-4 tablespoons of potato starch and a few tablespoons of white wine in a small bowl. Heat the rest of the white wine in small pan on medium heat. Add jam of your choice (apricot would hit the spot), then stir and mix so that the jam melts into your wine. Adjust the sauce to taste and leave it to come to just a simmer. Remove the pan from the stove and stir the potato starch into the heated mixture. Finally, plating. Pour a few spoonfuls of your sauce on a dish. Place the carved the duck onto the sauce and let your dinner guests finally feast. We recommend a sharp Pinot Noir to wash it down, but a Riesling also has us sold. More on Zhu? Visit her website.